EE stands for Everything Everywhere but take it from me that does not include customer service, that comes under NN Nothing Nowhere. The amalgamation of Orange and T Mobile resulted in EE and would save each company overheads and link the transmitting masts for use by subscribers to both the old networks. So why do they try to fleece customers of their money, Ofcom say they are the most complained about phone company with changing terms and conditions being a big complaint. Now I have had an account with Orange for the mobile/cell phone for almost 20 years. The plan I have includes 400 minutes to all other networks, 300 texts and un-limited calls to landline phones plus 500 mb of data. I never use all my allowance and as I get a free phone each time I negotiate a new contract I think the £16 ($24) is not a bad deal. now these figures I`m sure can be beaten by some readers but my 20 year loyalty stems from the fact I find the network coverage as a continuous cruiser pretty good so why risk changing networks. My connection with T Mobile goes back about 7 years and came about by Orange being bad for mobile internet coverage. Nowadays we have the benefit of using both companies masts. My present contract costs £15 for a 5GB allowance which includes the device that sends a signal around the boat, and like the phone the allowance was rarely all used. If it did go over T Mobile had a fair use policy that states they will restrict your download capabilities but you can still browse the internet and send e mail. tried to get a link to this but it seems they are trying to edge it out the door as it`s very hard to find the wording. Now checking T Mobile U.S.A. that 5Gb costs $40 plus $7 over 24 months of contract for the mobile broadband Mi-fi device. So $47 (£29.70). Oh plus a one off $10 for the sim. So double my UK plan. I have heard the 3 network here in UK has started phasing out their all you can eat data allowance on mobile internet via a modem. Some folk use their phone as a base but this is now being stopped. So perhaps the bandwidths are getting clogged and the networks are trying to cut down on big users. Now the point of this blog post is to warn others in a similar contract to beware. Just recently Jaq was watching the Olympics live on the internet and of course the allowance was gobbled up at a fast rate. No worries the fair use policy will kick in and all will be good. Wrong. T mobile or should we say EE started adding charges of £3 each time the internet was used for any amount of time. I tried 3 times to communicate via my on line account until finally someone E mailed back saying they do not deal with mobile broadband and I should dial 150 from an EE phone. Wonderful advice seeing as I had previously done this only to be told that as I phoned via Orange and my broadband was T Mobile they would have to transfer me!!!!!! 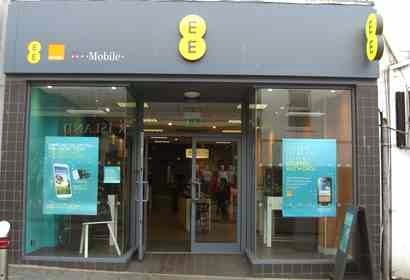 So it seems EE is not the new company and the others still deal independently. What a mess. EE or Every Excuse not to help you. Not quite true because they did offer to transfer me back to the same dept....twice and when correcting this they cut me off....twice hence the 3 E mails. So back to dialling 150 and after 2 goes got through to someone who cared. Gavvy was her name, remembered because it was the only good point of 2 hours on the phone. Now it turns out the fair use policy was not included in my new contract. Why, who knows. Gavvy and I have no clue but from Ofcom this seems to be a big complaint, terms and condition changes without telling the customer. So the best Gavvy could do was reduce the next bill by 50% and re instate the fair use policy. 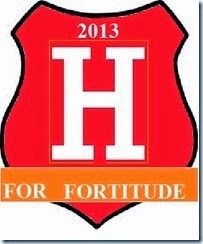 With your back against the wall it`s always best to take what you can and regroup for the next attack. Now my next move will have to be a letter to head office to get the other 50% refunded. Customer service in this country stinks. Jaq is appalled at the way us Brits are treated. Just as an example she is having a problem with her new glasses so she phoned the U.S. to ask about her last prescription and even though she told them she was living in the UK they phoned back within 10 mins of her message with all the details of her last eye test. Not just customer service but past customer service, they knew she was not coming back to them but still gave good service. So folks be warned that when you change your contract with any provider just check that the terms have not changed. As we work our way south again, Les looks for spots to moor that offer some trees and local wildlife, knowing that I may not see the 11 million people running the rat race in London, but I feel their overwhelming presence all the same as we move ever closer. The bridge at Sharpes Lane, Bourne End. Bourne End is one of those places offering a charming snippet of countryside for the eye. 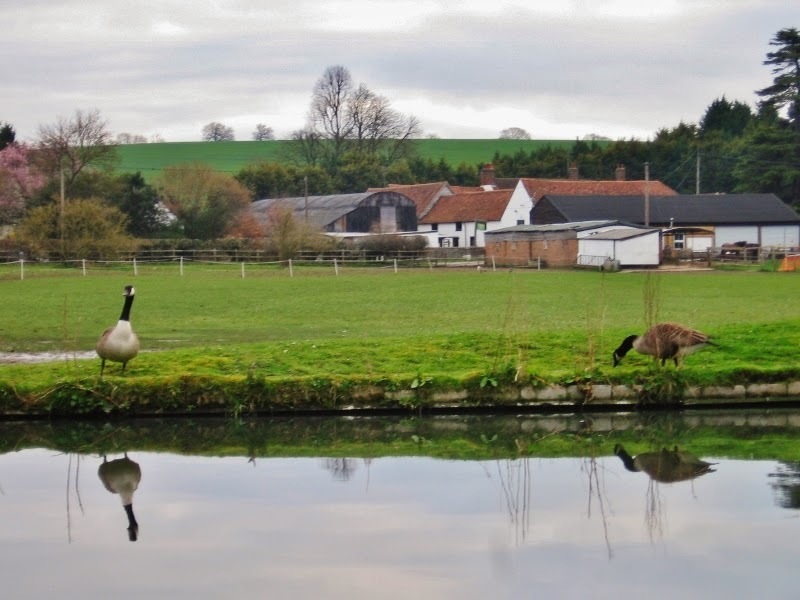 Across the canal from our mooring is Pix's Farm with its eight horses, two goats, and a bank that rises and curves, offering ducks, geese and swans a premium mooring place. Sharpe's Lane crosses over the bridge in front of us, a typical narrow, leafy lane to the bus stop up the road by the pub. We took the bus into Watford so I could have an eye exam and order new lenses for my glasses. Les and I spent a week here enjoying the farm across the way, taking walks up the towpath to the Gulf station for a Saturday paper, saying hello to boaters we know like Les and Heidi on WB Blue Pearl, and waving to those we've never met like Graham and Brenda on NB Jannock. We enjoyed four continuous days of sunshine in which spring busted out all over. Gander and goose on guard. Pix's Farm is in the background. warning off any interlopers stopping to rest in the farmyard or cruising down the canal from Kings Langley. On any given morning their obnoxious honking starts in just before sunrise followed by wild splashing of water as the male chases off any who dare to pass his demesne. This particular male gets so worked up, that once all the strangers have cleared off, he gets out of the water and stands with wings practically on hips, complaining quite loudly to the Missus. At one point this gander went after anything that moved--small songbirds winging over his patch, a butterfly, a Moor Hen nibbling the greens at the bank's edge, several ducks having their morning bath, and even a pair of swans who ignored his bad manners and continued on down the canal without so much as a ruffled feather. I woke one mist draped morning to a raucous ruckus just outside our bedroom porthole. The gander was having after a pair of his species who hadn't heard about this stretch of the cut being off limits to anything that moved. After ruffling their feathers, said male goose was in such a tizzy he flew up on the bank, stretched out his long, black neck, folded his wings behind him, and stalked across the bank hissing and honking at another goose--only to be bought up short when he realized it was his partner. She was not amused. The next time her mate took off after some intruders she glanced over her shoulders and stalked away to commune in the farmyard with the new goose crew that had just flown in. Her fella returned to his patch to find it, well, abandoned! Calling for his partner, the gander stood looking around, listening for her return call. Nope--nothing; zip, nada. The morning air was still and quiet. The gander dropped into the cut and began swimming slowly up the canal, away from his beloved territory, lamely calling for his best beloved.."Honk....honk......honk." He floated in quiet dejection. Movement caught my eye. I spotted his Missus up on the bank, listening to her partner's lamentable cries. She still didn't give him a nod. Finally when he fell silent, head down, she took off in low flight up the canal and flew right by the gander. He rose out of the water, following. Later that same day they returned to their patch having made up, the male goose a bit more circumspect. Sitting on the bow of a sunny morning, tea mug in hand, a warm spring wind ruffled my hair and kissed my cheek. I heaved a sigh of delight, stretched my bare toes against the bow and watched as one of the horses on Pix's Farm led a mutiny. The farm yard was standing under a fair amount of water after the winter storms. There was still enough water in the low lying areas for geese to float on the informal lake. The farmer had fenced off a drowned corner of his land which abutted the canal. Willow thickets and dry reeds stood forlornly in deep water and thick mud. The fencing consisted of metal rods stuck in the ground with tape strung across to keep the area off limits. A large white horse decided the young spring shoots were looking MUCH better inside the fenced off corner. She looked back over her shoulder several times, tossing her mane, checking with an edgeward looking eye to see if the farmer was paying any attention. Quickly the white mare pushed against the tape, stretching our her long, white neck until the metal posts slid sideways against her weight and the tape fell to the mud. She was in! While this was going down a brown gelding and darker pony stood watching. The gelding too seemed to look off towards the farmhouse for anyone scoping the action. Soon he followed the white mare over the broken fence line with the pony close behind. Eventually the farmer's wife came out, saw the broken fence and spent an interminable time coaxing the horses back to drier pastures. In the meantime the police showed up on the bridge in front of us, looking for some crook on the lam who had sprinted away down the canal. They shouted out to Les if he has seen a man in Levi's and a black shirt. Nope...shortly thereafter a woman cycled down the towpath and stopped to say she told the coppers she had seen the man in question out of breath further up by the petrol station, talking on his cell phone. The perp managed to escape despite four police cars spending hours going back and forth across the bridge and up and down the lanes. This same guy was spotted several days later sitting on the benches by the pub waiting for the bus! Not fifteen minutes after the horse break out and the appearance of the police, three CaRT employees showed up in bright green vests. One had a shovel and the other two had large clippers in hand. Apparently a local jogger called CaRT to say her dog had hurt its paw of a piece of rusted barbed wire sticking up out of the ground along the stretch of the towpath just adjacent to our boat. Off they went--Larry, Moe, and Curly--to uncover what turned out to be a twelve foot length of old barbed wire partially submerged in the towpath dirt. A yank on the end and it came loose from the dirt. Job done but it does beg the old joke, "How many CaRT employees does it take to free a bit of wire from the ground?" The bird life is different over here from those I know back in the States. I don't recognize their songs here in the UK. I wish I did know which bird in particular repeats just one note, over and over, sounding for all the world like the alarm on a truck backing up. I would like to thank it for the best morning laugh I've had in a while. Les in recovery from his morning wildlife alarm. I woke one morning about an hour before the sun rose, to a bird repeating this one single note. As I lay there half awake Les shot straight up from a dead sleep and declared, "There's an alarm Jaq--an alarm is going off on the boat!" Dear Sir thrashed about, struggling to escape the embrace of the duvet he had wrapped snugly around him during the night, Pajamas all crooked and wonky, sleep still lingering in his head as he tried to climb over me, get out of bed and find the problem. One never knows when the next bit of excitement will strike on the cut! The one bad thing about heading to London is that `out in the country` moorings become scarce as fields have become the exurbs of London. 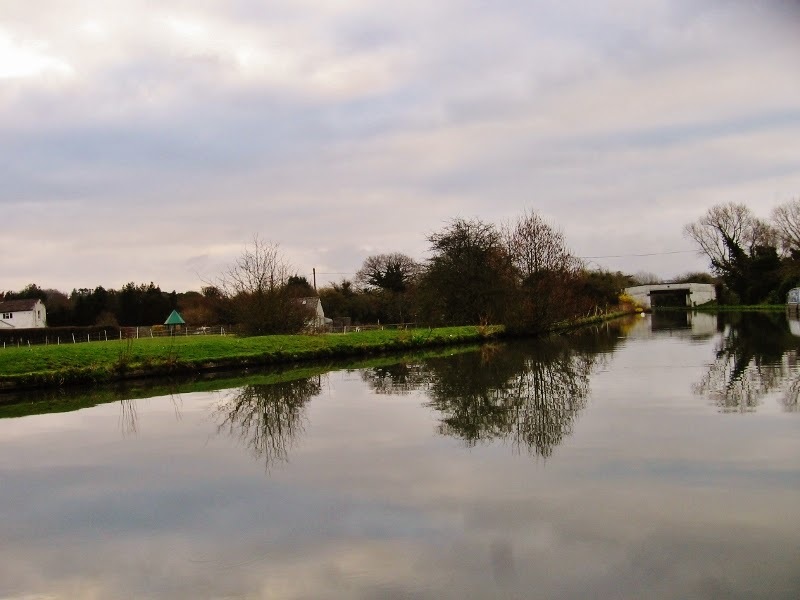 We are now about 22 miles from London and villages have become towns that in turn are sucking up the green spaces right up to the canal towpath. Readers do ask about moorings, so here are some pics of recent moorings, below. These are by no means typical. Mostly we are in very remote places but like any big city London is spreading and we are going through commuter country. 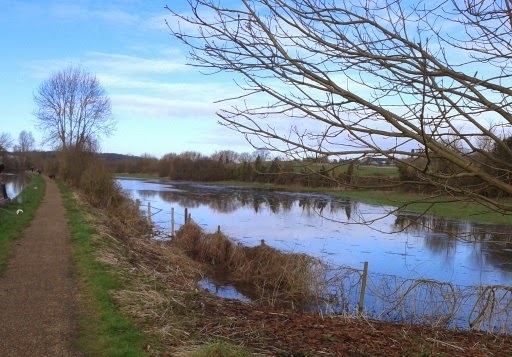 The top picture is just below Cow Roast and the flooded field is one of several hereabouts. The second is the view across the canal and hidden amongst that woodland is (left) the site of springs that are to become the river Bulbourne. This area is Dudswell and this being the rivers source is disputed. Bulbourne is some 3 miles to the north but it is said the canal was built over the original river course. The Bulbourne will flow in, out and alongside the canal for many miles Until it joins the river Gade at Hemel Hempstead. 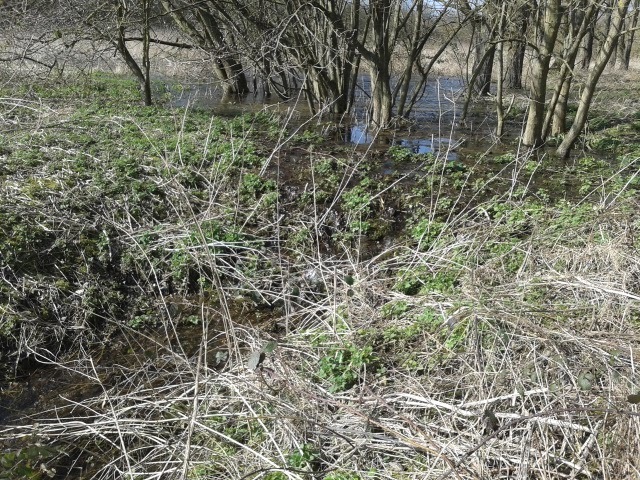 In years gone by it was the feed for many watercress beds along it`s route. A very old gent once told me that in wartime watercress production came under `reserved occupation` status and some used this to stay at home. Not sure how valid that is but the old boy enjoyed telling me about the cress beds through Hertfordshire. This is Bourne End opposite Pix`s farm stables. Pleasant enough but although the trains run out of sight behind the trees they can still be heard a little. Towpath side the Bulbourne runs through a field alongside a main road that`s far enough away not to be a nuisance. Now we are In Hemel Hempstead and we need to moor here to enable Jaq to have her eyes tested and have upgraded lenses fitted to her frames. So just 2 nights but just ahead the moorings amongst houses and shops right next to the towpath are full so not much choice. It was quiet at night. This is near to Hunton Bridge. Compromise again in that the housing is far enough away but the railway is close passing through the trees in the first picture. Towpath side across fields is a main road but far enough not to cause a noise nuisance. I can think of a few reasonable moorings on the way into London but although they might be away from roads and railways civilisation will always be very close by. A good mooring is one that you can not see any light pollution and any light might be just a farm building. As we cruise along Les and I keep our eye's peeled for downed trees along the canal. 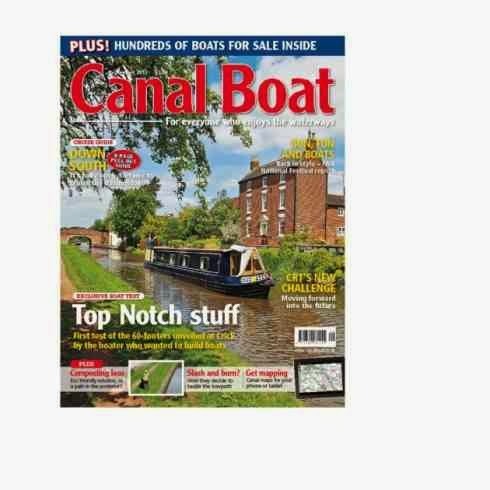 As most boaters will tell you, usually these offerings fall on the off-side where the canal bed is shallow and a boat cannot get close enough to cut up the tree. Sometimes we are fortunate to find a windfall near a lock as we did near Seabrook lock last month. In years past with water levels low, we've had to pass on some good wood stock because there was no way to get near them. 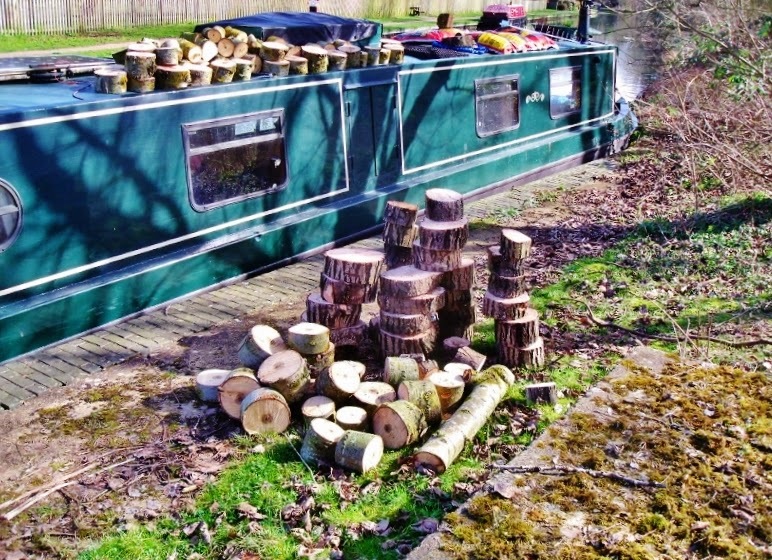 With this winter's ferocious winds and millions of cubic feet of water relentlessly battering the UK, trees are uprooted everywhere; there is wood to be had it seems around every bend on the cut, as happened on the Grand Union Canal between Dudswell Locks 47-48. There was an old Willow down on the offside between these two locks which had been hacked at over the years by boaters desperate for wood. The winter storm of Valentine's Day 2014 took down two more trees in the same spot--the tops of which hung partially in the short pound between the locks, blocking the offside of the canal. Usually this short pound is incredibly shallow, which is another reason the old Willow tree was still laying there on its side. With the winter of unprecedented rainfall, water flowed continually over the tops of the lock gates and the pound was quite full. We made plans to head south from Cow Roast after Les' winter of recuperation. Sadly still tied to the Watford area by two more surgeries to come, Les has decided to cruise slowly down to London for a week and then back up again. So we walked down to Dudswell locks and sussed out the situation. The lock gates at Northchurch just south of Dudswell had been padlocked to keep boat traffic from attempting to cruise down to Berkhamsted where a lock was drained last month for major work by Canal & River Trust (CaRT). It was due to open again on February 11th. 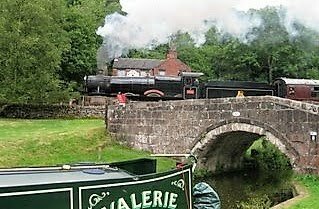 I suggested we move down from Cow Roast, come just out of Dudswell lock 48 and moor up outside the lock on the nice, hard edging of the offside. This allowed us perfect access to the downed trees, and plenty of room just near the boat to cut it up with the axe and stack it on the roof. We could get away with mooring on the lock bollards because no boats were moving down to Berko yet--everyone was waiting for the Northchurch lock to open. A shy wood sprite watches us! 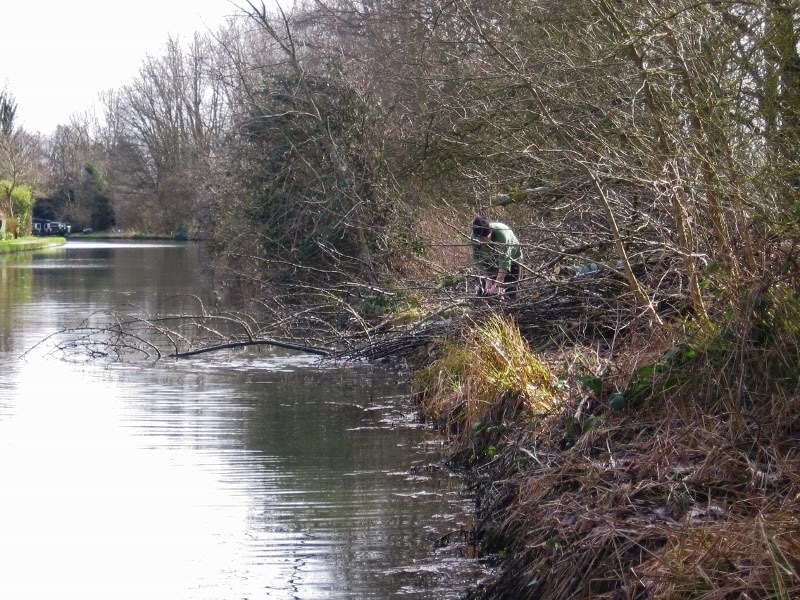 As Les sawed the overhanging boughs into manageable sections we pulled them from the cut and began building a debris pile alongside. Shortly the pound was completely cleared again. Les and the chainsaw chewed through the large boughs, cutting fat rounds of wood I could manage--four at a time--to carry back to the boat. 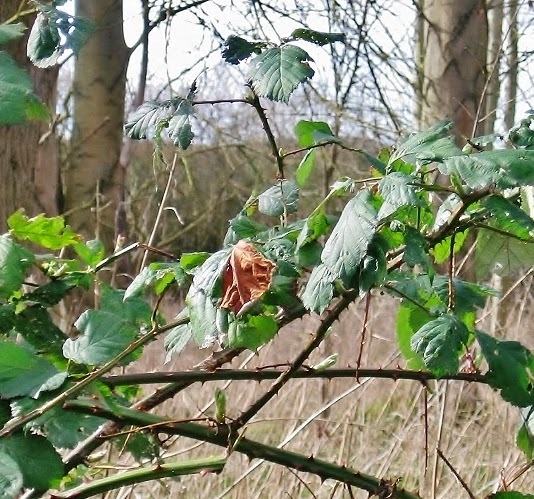 Our efforts were overseen by a shy wood sprite, whose face peaked out at us from a dead leaf on a nearby branch. During tea break a young bloke on a plastic cruiser came down through the lock and we invited him to moor up in front of us. He was interested in sussing out some wood for himself. As the afternoon went on we discovered the young man was headed down to London and over to the Lee Navigation to moor up permanently. 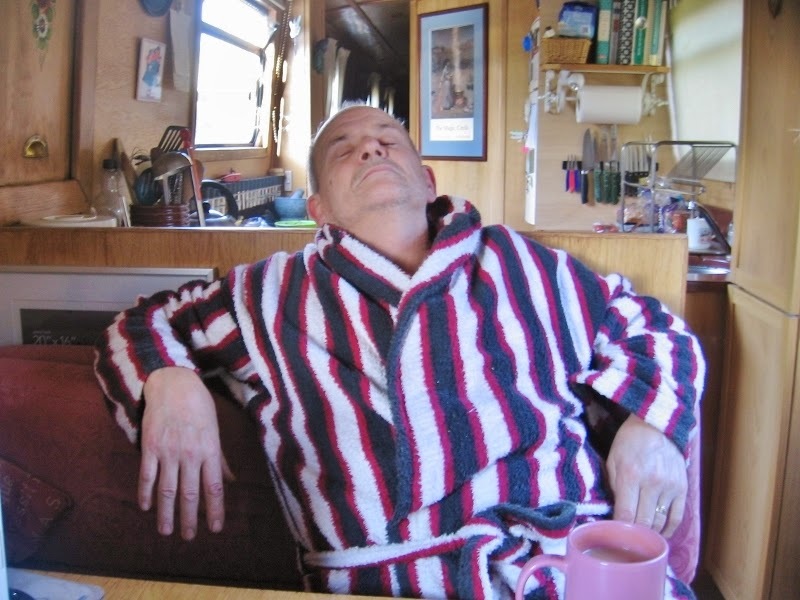 He was new to boating, having lived in squats around London until he saved enough money to buy a second hand boat on which to live. He didn't say what he did for a living so I didn't pry. We talked about how ridiculously expensive rent is in and around London--especially for those in the service trades. Friends of his were living on a boat and convinced him it was the cheapest means of affordable living near the Capitol. After six and a half hours of grafting Les and I had a good stock of fresh wood cut, split, and stacked on the roof. We moved over to the towpath side and spent a couple of lovely days watching the two donkeys in their luxury enclosure on the other side of the fence while we waited for the locks south of us to open again. As we cruised south we discovered a feast of wood everywhere. We were so spoiled for choice we passed up some off cuts by CaRT who've been trimming the overhanging growth on the offsides, from Leighton Buzzard all the way down to Bulls Bridge over the mild winter. 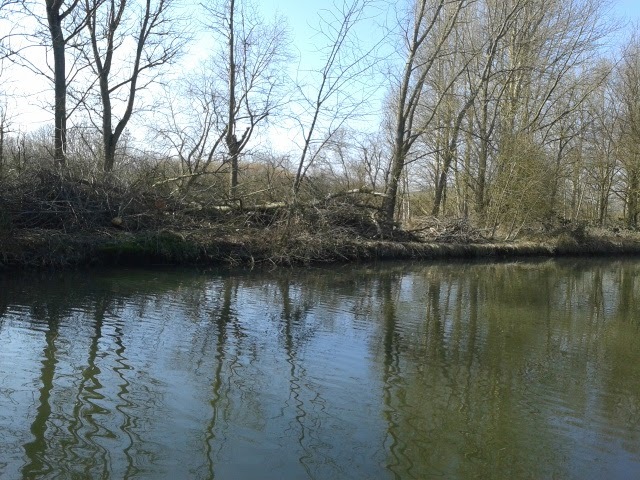 As we traveled through Boxmoor Park and Hemel Hemptead we spotted two mighty uprooted trees near the canal. Boats moored nearby sported roofs covered in wood. We decided we would stop at the edge of Hemel near the B&Q (for Americans, think Home Depot) so Les could purchase another can of paint. In his spare time he's been grinding away at the rust spots on our boat, treating and repainting them. As we approached Boxmoor Lock Les spotted yet another downed tree just near the lock on the offside! We moored up while he sawed the large branches into fat rounds. I brought the boat into the lock, we dropped a paddle to bring the roof down lower, and stacked the fresh cut rounds on the roof for splitting later. Again, while we know this tree wasn't Willow, we aren't sure what it is. There were conkers on the ground nearby; it could be Horse Chestnut. I took another slim branch with one big, fat bud on the end to force. The first branch is in full bloom now. Frilly, bright green catkins with reddish ruffled edges drupe from sticky sleeves. No leaves have unfurled yet, but they are beginning to peak out from the buds. I suspect the trees downed at Dudswell may be Alder. Since NB Val is now sporting a rash of different green colored spots where Les has been grinding off the rust, we have decided to paint her ourselves next year. In the meantime I can choose new paint colors. At the present I am favoring Dulux Weathershield Highland Green with light cream and Gold Rush accent colors, although I am liable to change my mind. As some bright spot once said, " A woman who doesn't change her mind doesn't have one." View Les' birthday card by clicking here! When we were under the assumption that Les was required to check into admission for prostate surgery on March 4th, 7am at Watford General Hospital, we booked a hotel for the night before. To get the best rate one has to commit, so we did, the surgery was rescheduled, and we found ourselves with a hotel room and no means of refund or rescheduling. We decided to make a date night of it. Les made arrangements for a coupon dinner special through Pizza Express and purchased tickets to a performance of War Horse. I was surprised this play was appearing in Watford. Les realized after paying £15.00 per ticket, that the event was actually listed as a film, however he couldn't locate any information on the Palace Theatre web site explaining what, exactly we had purchased but we decided to give it a go. Anonymous A was kind enough to give us a lift into town. Thank dear friend! We appreciate your kindness. We checked in to the Jurys Inn, got our bearings, and walked to Pizza Express for dinner. Away from the boat, Les and I focus in on each other and our conversations tend to be deeper and more philosophical. Dinner was delicious and we were relaxed and set to enjoy an evening of...theatre? Film? Theatrical Film? Our seats were front row center. We peeled out of our winter coats and settled down. 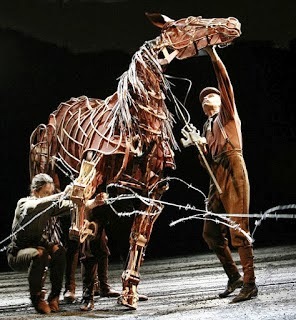 It quickly became apparent, with the pre-show material being screened, that we had paid for tickets to a live broadcast from London's West End National Theatre of War Horse! Essentially we were only one layer removed from the actual live performance. Teh camera filming the live event actually offered us better views than the best seats in the West End theatre. I wondered if Les, with his slim experience of theatrical productions, would be able to engage in the suspension of disbelief while watching a giant movie screen; I wondered if I could as well since the puppeteers are always in sight throughout the performance. The lights went down, the National Theatre cameras panned across the live audience as the lights went down in London and the show began. I can only say it was wonderful. The Handspring Puppet Company puppeteers were amazing--unobtrusive, and yet the living essence of their characters, providing not only the movements of each animal but also the vocal sounds. It was brilliant! I've never seen anything like it in my long experience of participating in theatre as a performer as well as an audience member. At one very poignant moment in the production I glanced sideways as Les wiped a tear from his eyes. Success! He was lost in the story unfolding in front of our eyes. Just after intermission, as a special part of the broadcast, five minutes was taken for the show's director and Michael Morpurgo, the author of the book, to chat about the craft of making the show and the puppets which helped place the overall production in context. Moved and surprised by our experience, we made our way back to the hotel in the strange yellow city-lit night, our breath spilling out of us in clouds as we walked arm in arm. Back in our room we took advantage of the deep, long bathtub and endless lashings of scalding hot water to soak in Gilchrist & Soames bubble bath--a sybaritic treat for narrow boat live-aboards who can only shower--and that for about three minutes before the hot water is gone. We felt we had the best seats in the house no matter where we sat. We experienced closeup shots of the puppets and actors in action from the best viewpoint possible thanks to the cameras which actually enhanced our personal experience of the play. Our tickets for front row, center cost £15.00. Seats in London at the live production in the very same section cost £62.50. We highly recommend folks take advantage of this fine means of experiencing great theatre. There are live broadcasts throughout the UK and overseas--even Seattle, Washington! British Opera and Shakespeare productions from Stratford-on-Avon are also providing live broadcasts, which means I have a great chance of getting Les to see Shakespeare's Richard III some day. Saturday morning and the canal was open. Boats came by in both directions but we decided to stay where we were for the weekend. The chainsaw needed sharpening and a general service but more on that in another blog post. So Monday came and we set off through six locks and have made a stop in Berkhamsted for some supplies as the supermarket is canal side making the heavy things easier to bring aboard. Along the way we spotted this Waterways Chaplain. They have been around for a few years now, although not walking the towpaths, and were part of the working boat peoples lives back in the early 1900`s when the Salvation Army had their own boat travelling the canals. Spotted these in a field alongside the canal. I just want to say, and the proof is in the picture. The 125mph East Coast mainline train noisily passes and they did not get a Llama d and just sat there. Sorry I`m just in a good mood. The only reason we have not started our journey into London is the stoppage in Berkhamsted at gas locks, so called because of the Gas works just past the north lock. It is due to open 4pm Friday but the workforce tell me it will be Saturday morning before they move all their equipment off site. The water mark on the lock wall shows the normal `lock empty` level. With the water levels lowered this picture gives a good view of what those wind up mechanisms do. The two on the gate are closed but can be raised to let water into the lock. The open one in the wall allows water into the lock via an underground tunnel. Standing next to the lock in the picture above this shows how close these two locks are. The edging to the left is new. 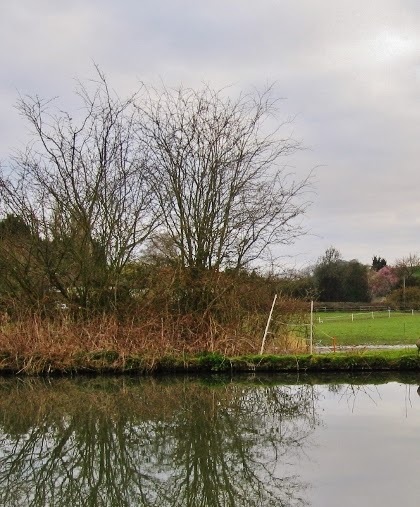 The Wendover arm is navigable for just about one and a half miles long at the moment and provides a very peaceful mooring. It is popular with walkers who have not just an abundance of footpaths but several benches, like the one in the picture below, to sit on. If you think the water looks a strange colour it is because of a chemical that Canal and River Trust have added to help detect leaks. Jaq says its Chinese Jade Green. Better than the usual mucky colour, CaRT say it does no harm to fish or plants etc. Just look at the seat before you scroll down. Above just two minutes from the mooring two footpaths cross, roughly on left by the trees, giving four routes through our beautiful fields of grazing sheep or cattle. I know this be strange for some readers but here in the UK millions of people roam across land legally, shutting gates etc. and having respect for the landowners property and livestock. The sheep are soon to lamb and a farmers notice asks for dogs to be kept on a leash. I said millions of respectful people but as always even in such a tranquil place we have an element that care for no one except themselves. Remember the bench. 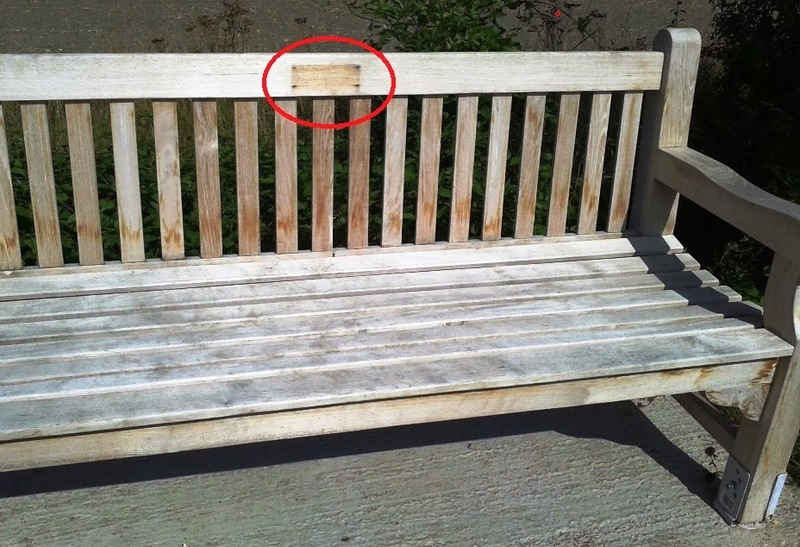 I do when we last visited it had a small Brass plate that stated the bench was in memory of a deceased relative. Now walking around the area I noticed two others that had the plates missing. Walking along the section of the Wendover arm being restored the footpath crosses the canal by this bridge installed by the Wendover trust with donations from the public. A metal plaque is purchased with your own inscription that can be again as a memorial or perhaps just a name of the donating individual or group. They are very firmly attached needing a hexagonal headed tool to remove them. As you can see on the right some scumbag has been trying unsuccessfully to prise them off. These are made I think from a very light alloy and quite a lot would be needed to achieve a weight worth selling as scrap. Not sure of other parts of the world but here in the UK metal theft is very much on the increase because of high prices of metals. None of the plaques seemed to have been removed, just damaged. The cancellation phone call came on the 25th and I have just received a letter dated the 26th with a re-scheduled surgery date of 23rd April 7AM. I must say they didn`t hang around organising a new appointment although I wonder if the admission time will change several times before the 23rd. Any bets? The NHS charter states that if an operation is cancelled on the day of your admission you must be booked in again within 28 days. If as in my case it is cancelled before the admission day then your new date must be within 18 weeks. I have cut a section (above) from the letter I received. The 7am admission bans eating 7hours before compared to the 11am time is only 5 hours. Strange, anyone remember when they admitted you the day before and hung a `nil by mouth` notice over the bed the evening before. 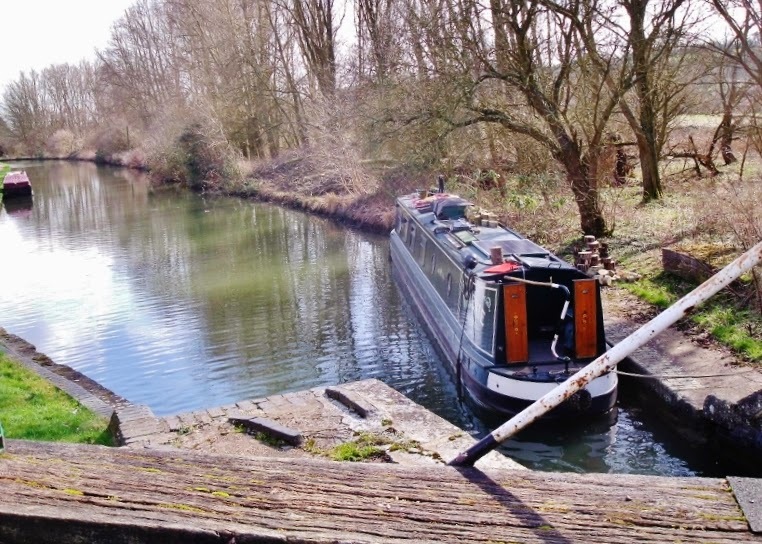 Our plans are still the same with the trip to London commencing as soon as the maintenance work at Berkhamsted (Gas locks 2) is finished next Friday. I guess the next thing will be another pre-op appointment. Perhaps I might be able to stop off at Watford as we cruise through and get this out of the way.